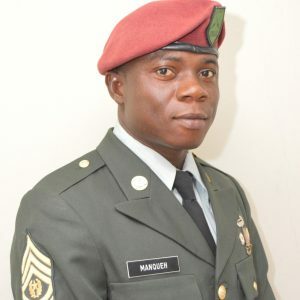 Command Sergeant Major (CSM) Cooper Manqueh was born on 26th July 1975 in Zayglay Town, Nimba County. He is a Christian and married with four children. He earned his high school education from the S Trowen Nagbe United Methodist High school in Ganta City, Nimba County. He obtained a Bachelor degree in Accounting from the Stella Maris Polytechnic in 2015. He joined the Armed Forces of Liberia on 22nd July, 2006 as a member of the first batch of recruits for the New Armed Forces of Liberia formulation. He was selected for the Basic Non-Commissioned Officer (NCO) Course that automatically qualified him upon completion for sergeant. He was privileged to attend the Officer Candidate Course at Barclay Training Centre (BTC) under the DYNCORP administration. CSM Manqueh has attended many foreign and local military courses to include; the United Stated Marine Corps Gunnery Sergeant Course in Quantico, Virginia USA 2013, the Warrant Officer Development Course at Horton Academy in Freetown, Sierra Leone, 2013, The United States Defence institute of Legal Studies, Liberia, The US Army African Command Inspector General Course, Liberia. the African Command Warrant Officer/ Sergeant Major Symposium in Washington DC, USA in 2010. CSM Manqueh obtained certificate from; the African Partnership Station Liberia, the Armed Forces of Liberia Instructor Training Course at BTC Liberia, he also holds a certificate and diploma in the United States Marine Corps Sergeant Course and Infantry Squad Leader Course Quantico, Virginia and Camp Lejeune USA respectively. CSM Manqueh also received the United States Marine Corps (USMC) GUNG HO Award from the USMC Sergeant Course. He had worked with the Monrovia Young Men Christian Association (YMCA) Account Section. CSM Manqueh is presently the Forces Command Sergeant Major Armed Forces of Liberia.